This entry was posted on Saturday, September 17th, 2016 by Frances Ryan. Bright and early tomorrow morning, long before the sun rises, my alarm clock will gently bring me out of Dream World. I will stumble out of bed, groggy and sleepy-eyed, and make my way to the kitchen to get my moka pot started making my morning coffee. And about an hour later—around 4:30—a taxi will arrive to take me to the airport. Because tomorrow morning, I am Croatia bound! 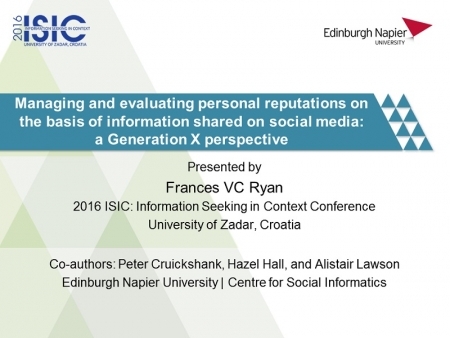 The main purpose of my trip is to attend the ISIC: The Information Behaviour Conference at the University of Zadar. There, I will deliver my paper, “Managing and evaluating personal reputations on the basis of information shared on social media: a Generation X perspective”, on Thursday to a (hopefully) eager audience of fellow academics. Because flights to Split are only once a week, I will have a couple of non-conference days to explore. So it’s kind of like a free mini-holiday! (A well-earned one, though. Writing academic research papers is not an easy feat!) Sadly, it’s not going to be a quick and easy journey! My flight to Split is a little over three hours. Then I have a 40-minute journey to the bus terminal to catch a bus to Zadar, which will take another three hours. I figure it will be about 12 hours from the time I leave home until I reach my hotel. And I’ll have to do the return journey next Sunday! I will have all day Monday and Saturday as free days (and a half-day on Friday) to explore. This is my first time travelling to Croatia so I’m really excited about the experience. I will be staying quite near the historic city centre and I should able to hobble around well enough to see a few sites. Top of my list is the Church of St Mary. I’m also hoping that I can find a few unexpected sites through the grace of serendipity. Initially, I planned to see several old churches and I hoped to run along the beach during my week’s stay. (My hotel is near the shore. Score!) But my broken ankle will really slow me down on the site-seeing—and will completely prevent any running. Still, Broken Ankle: Phase II means that I am hobbling a bit faster and with less pain, so I won’t be laid up in my hotel room the whole time! Anyhow, I should probably get back to packing so that I’m ready when my taxi arrives bright and early tomorrow morning. And don’t worry—I’ll be sharing plenty of pictures when I return from my travels!